Soon, Chinese electric bus maker BYD will start manufacturing in India for the domestic market, as well as exports to neighbouring countries. Hyderabad-based Gold Stone Group, which sells BYD buses in the country, is setting up a greenfield manufacturing facility in the country at a cost of around Rs 200 crore. Goldstone Infratech Managing Director N K Rawal said the new facility, coming up this year and to be spread across 100 acres at Bidar in Karnataka, will have an initial capacity of around 1,000 units a year. Localisation of the product, around 25 per cent initially, will be increased to 50 per cent by 2020. "We will also start manufacturing batteries in India," said Rawal. His company is also talking to various state transport undertakings (STUs) and other players to set up charging stations. He expects 10 cities - Mumbai, Ahmedabad, Jammu, Delhi, Lucknow, Kolkata, Guwahati, Hyderabad, Indore and Bengaluru - to bid for 390 electric buses in the coming months. A major challenge for STUs is upfront cost, even as they realise that the total cost of ownership will be low. While the cost of buses is coming down and the government is also supporting with new schemes to induct electric buses, the company says it is open for a public-private-partnership model, under which to would acquire and manage vehicles, and STUs could operate and share the revenue. Rawal said the company would also start exporting buses, under the BYD brand to neighbouring countries starting this year. On whether Goldstone will also look at other segments, Rawal said: "We are exploring, nothing has been finalised yet." 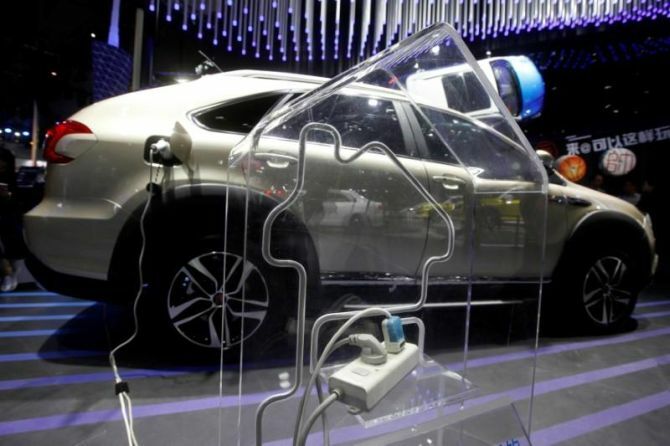 Goldstone Infratech has signed a technical collaboration agreement with China’s BYD, one of the largest electrical vehicle manufacturers in the world. Besides buses, BYD also manufactures electric cars and trucks. Goldstone is the first company to have bagged orders for 31 buses and delivered 100 per cent electric buses to two STUs - Himachal Roadways and Transport Corporation (HRTC) and Brihan Mumbai Electricity Supply and Transport Undertaking (BEST). The company also completed trials of its electrical buses in Delhi, Bengaluru, Hyderabad, Rajkot and Chandigarh. In Pix: Inside the Rs 2.73 crore Mercedes-Maybach S650!